Love this! It explodes with flavour and is super simple, if you feel really lazy you can use BBQ chicken and it's ready in less than 15 minutes. I make this a lot. Delicious. Easy and tasty. You dress at the table so those liking less chilli can hold back. If you're making a full Chinese meal for a crowd, this is useful as it can be made ahead of time. A good, simple cold dish. Serve it with peanuts and spicy cucumber salad for a small cold dish course. These are surprisingly good, a new texture (as Fuchsia says, crunchy but not crisp), and very moreish. Delicious. I love the ‘fish fragrant’ style and it comes together so easily. Works without the cloud ear muchrooms if necessary. A big hit. Unctious and tasty - fatty too but you have to embrace that with pork belly. Yum. The beef dries and toasts a little, almost as though you cooked with jerky - in a good way. Then there is a fresh crunch from the celery. Great recipe, needs no adjustment for us! This is delicious! I used chicken thighs instead of breast and it was moist and juicy. Next time I might add more sichuan pepper. Tasty though we were not fans of the whole sichuan peppercorns, they got pushed to one side. A little oily but the spring onion greens added at the end cut through that. Delicious. Nice accompaniment to the chilli heavy dishes in the dish and really quick to throw together. I tried this today for lunch as I was looking to try more dishes from the Fushia Dunlop book and had some leftover cauliflower and streaky bacon. It was surprising as the dish did not strike me at all as Chinese - I mean it does not use any typical chinese ingrédients. Yet again, it does not seem to be really European either, it would not have come to my mind to cook cauliflower that way. Anyway, it was OK and a new way to use up cauliflower. I think this recipe benefits from a shake of sugar on the tomatoes as they cook, and a bit of chicken broth or maggi powder stirred into the eggs. When using baby leeks, I add them earlier than the recipe calls for, to cook them down somewhat. This is a fantastic recipe, yielding an extremely authentic version of the dish. I have made it countless times, and even Chinese friends say it's among the best renditions they've tasted. Lovely. Delicate and tangy. Good use for pickled mustard greens used elsewhere in the book. I've made both versions of Dan Dan noodles from this book and prefer this one. I only used 1 tablespoon of chilli oil and drizzled a little sesame oil in at the very end. It is hot, spicy and delicious. Came together in about 15 minutes which is perfect for a weeknight dinner. These noodles are spicy and delicious. Not hard to make, only suggestion is to cut back a little on the dark soy, it can be a little salty. This hot water/lard wrapper recipe is great, so easy to work with and get nice and thin. Not tried with this filling. Seriously good, pastry nice and easy and comes together well, filling tasty - even with stock from a cube. The celery is really great. Note the deep red of the oils and the sprinkling of fried chili and sichuan peppercorns. A fantastic dish. It's noodles with pork mince - think of it as a Chinese Spag bog and you are not far wrong. This extremely authentic Sichuan 'snack' is a right faff to make, but the results are absolutely amazing. Every time I make it - (I never do enough) the meat tends to disappear. ...you get the history of the strangely named dish....fantastic. ...possibly my favourite Chinese dish...A heady mix of chilli bean paste (Douban jiang), sugar, garlic, soy, shaoxing rice wine and so on. Doesn't taste fishy - but in my mind tastes amazing. There was definitely some crackling - but I think the main problem was the sauce had become too thick with the addition of the corn flour...overall - a fun nice dish and another success from Fuchsia. Sichuan food is one of the great unknown cuisines of the world, famous in Chinese history and legendary for its extraordinary variety and richness. Chinese people say that China is the place for food, but Sichuan is the place for flavour, and local gourmets claim the region boasts 5000 different dishes. 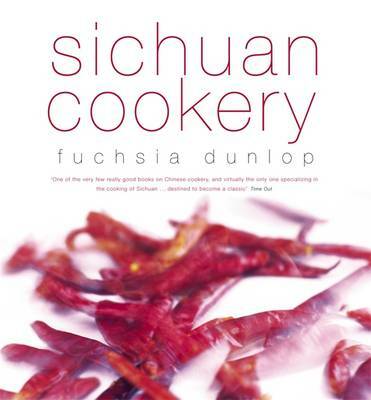 This book includes sections on the history of Sichuan cooking, the 23 flavours of Sichuan, the region's culinary culture, the art of cutting, presentation and nutrition, ingredients and methods for a whole range of recipes, from home peasant cooking to banquet dishes of the highest quality. Full of intriguing anecdotes and packed with the most delicious recipes, this book is an absolute must for those interested in this wonderful cuisine.